Matt Martell, from Charlotte, N.C., who marched this past summer with Carolina Crown, sent in this one. 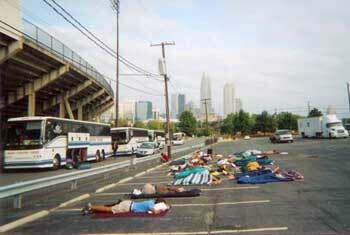 "This picture was taken about 7 in the morning as we got into Charlotte for our home show. We had a about an hour before breakfast was served and we were rehearsing in the stadium, so a few of us got out our bags and went to sleep in the parking lot." Thanks Matt!